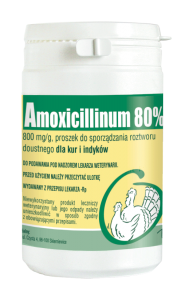 Amoxicillinum 800 Biofaktor is intended for chickens and turkeys for the treatment of infections caused by Clostridium perfringens, E. coli, Erisipelotrix rhusiopathiae, Haemophilus paragallinarum, Pasteurella multocida, Salmonella spp., Staphylococcus spp., Streptococcus spp. Preparation Amoxicillinum 80% is intended for chickens and turkeys for treatment of infections in poultry caused by Clostridium perfringens, E. coli, Erisipelotrix rhusiopathiae, Haemophilus paragallinarum, Pasteurella multocida, Salmonella spp., Staphylococcus spp., Streptococcus spp. It exhibits high efficacy in treatment of staphylococcal-streptococal infections of upper respiratory tract in chicken broilers with colibacteriosis, infections with Salmonella spp during hatching, ulcerative enteritis (Enteritis ulcerosa), necrotic enteritis (Enteritis necrotica) in chicken and turkey broilers and staphylococcal-streptococcal infection of joints in chickens and turkeys. Preparation must be administered after dissolving in drinking water in a dose of 10 mg/kg b.w., for 3-5 days. In practical usage one must dissolve 12,0 g of preparation per each 100 litres of drinking water. Remark! Aqueous solutions of preparation must be prepared immediately before use. Do not use in case of sensitivity to penicillins and/or cephalosporines. Do not use in treatment of infections caused by penicillinae-producing staphylococci. Do not administer to hens laying eggs for human consumption. The drug is produced in three dosages: Dirofen Plus for kittens and puppies (120 mg tablets), Dirofen Plus for cats and dogs of small and medium breeds (200 mg tablets) and Dirofen Plus for dogs of large breeds (1000 mg tablets). Store in original package. Protect from light and moisture. Keep out of the reach of children and animals. Store separately from food and animal feeding at +5-25°С. 3 years from the date of production.